Nope, this most certainly is not gazpacho. It’s more complex in terms of taste—though not at all complicated to make—and calls for cooking as well as some ingredients not common to gazpacho. It does, however, have the same soothing, chilling effect as that other chilled tomato soup on all those who partake. 1. To make the chilled tomato soup, bring a large pot of water to a boil. With a sharp knife, make an “X” in the bottom of each tomato. Plunge the tomatoes into the water and cook for 1 minute. Drain and set aside until cool enough to handle. Using your fingertips, slip off and discard the skins and remove the seeds. Roughly chop the tomatoes and place them in a bowl along with their juices. 2. Heat the oil in a large pot over medium heat. Add the onion, leek, fennel, celery, red pepper, garlic, and bouquet garni. Cook, stirring occasionally, until the vegetables are softened, about 15 minutes. Reduce the heat to medium-low, stir in the tomato paste, and cook for another 2 minutes. Add the chicken or vegetable broth, bring to a boil, and simmer for 20 minutes. Add the chopped tomatoes and their juices, return to a boil, then lower the heat and gently simmer for 5 minutes. Remove from the heat and let cool. Transfer to a large bowl, cover, and refrigerate until cold, 1 to 2 hours. 4. To serve, ladle the soup into individual bowls or one large serving bowl and garnish with the feta, olives, basil, a few chopped tomatoes or halved Sun Gold tomatoes, and a drizzle of olive oil. Chilled Tomato Soup with Aged Feta and Olives Recipe © 2010 Darryl Estrine | Kelly Kochendorfer. Photo © 2010 Ellen Silverman. All rights reserved. All recipes and photos used with permission of the publisher. This recipe would be AMAZING for a spring or summer brunch! The ingredients were very easy to find. Although tomatoes weren’t quite in season when I made this, if they were, this soup would be one to drool over! The fennel, the olives, the cheese all danced in perfect unison! I used homemade chicken broth, which truly does make a huge difference. It would be an injustice to make this soup with a broth that tastes like boiled salted water. Also, celery salt can be overpowering, so I would caution the novice cook about this as well. The weekend weather looked good for the first time in weeks. I wanted to ditch cooking and work in the garden until dusk. Well, this recipe became a perfect “accomplice” in the weekend game plan. I made it on Friday and chilled it overnight. After a day of hard work in the yard, I had the soup with avocado salad (just avocado slices with balsamic vinaigrette) for dinner—light and refreshing. Score the skin of the tomatoes before dipping them in boiling water; it makes peeling a breeze. This weekend ended up being hotter and way more humid then predicted. I was grilling up some big, thick pork chops and I was melting in the heat. When I finally sat down to eat, I didn’t have much of an appetite. I had prepared this chilled soup in the morning, and when we sat down to dinner on the patio, it was our first course. WOW! After that first spoonful, my core instantly cooled down and the 30 minutes I just spent preparing dinner was washed away into a refreshing harmony of vegetables. It was the perfect start for the rest of our grilled dinner. This is not a gazpacho. Something special happens when the vegetables are simmered together for a short time with chicken stock. The tomatoes mellow and become less acidic. The big flavors, like the fennel, get tamed. 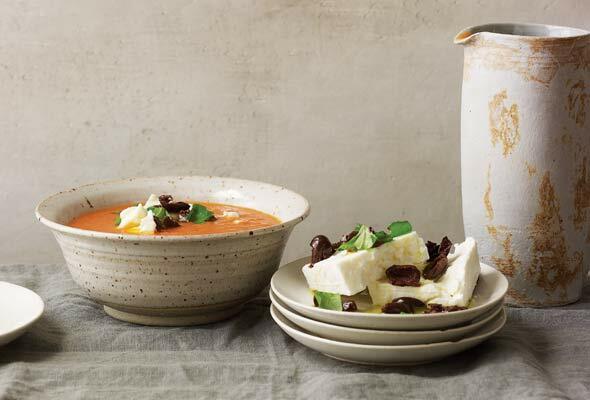 The addition of the red pepper makes the soup stand out and hint at a romesco sauce. I used Roma (plum) tomatoes since these were the best in the market that day. To give myself an edge, I always cut a shallow “X” at the bottom of the tomatoes when I am planning to skin them. I garnished the soup with Bulgarian feta and Cerignola olives, as these were readily available at my market. This soup will be a staple this summer in our house. I can’t wait to find out if it will freeze well, so it will always be at the ready. This soup is easy to prepare and flavorful even when tomatoes are not stellar. And if the season is chilly, this soup was just as delicious served warm. If I was going to make a slight alteration, it would be to lower the amount of olive oil used to sauté the vegetables from three tablespoons to two, or even one. There are a lot of types of hot sauce to choose from. I often use Sriracha Hot Chili Sauce Huy Fong. You can find this in the Asian section of well-stocked grocery stores or in Asian groceries. If your soup leans towards the sour, acidic side, 1/2 teaspoon of sugar can take off the edge. Or include half a carrot in the pot when you add the chicken broth and then remove before blending. 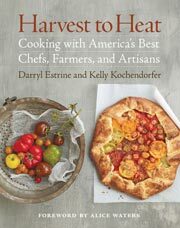 I made this soup in May in the Northwest…not the peak season for heirlooms. I used Canadian yellow heirloom tomatoes, variety unknown, and 2 Romas, variety unknown. I liked the mellow taste that resulted from primarily using yellow tomatoes. All parts of a fennel bulb are edible: the white bulb, the green stalks, and the feathery fronds. For this recipe, dice the white bulb portion. You may have to search for the barrel-aged feta. I found mine at a large natural foods store. The brand I purchased was Mt. Vikos. I found this feta to be less salty, with a creamy texture. This is one of those times that the expense for the barrel-aged is worth it! The recipe calls for Taggiasche (Ligurian) or Niçoise olives. I chose to use the Niçoise olives and liked their delicate size for garnishing. Just double-check to see if the olives are pitted before garnishing for no dental surprises — or warn guests. Because there is salt in the feta and in the olives, you can go easy when salting this soup. In fact, taste it cold before adding salt. I tend to prefer food slightly on the salty side, and 1/2 teaspoon was fine. A quarter teaspoon or even no salt would work for some people. I like to go light on oil, and found that extra oil for garnishing was not necessary. But just wait until you taste the soup with the feta, olives, basil, and finely diced tomato garnish — oh so good. To make a heartier version, blend 3/4 of the soup and leave 1/4 unblended. I suggest doubling the recipe to serve bowls to more than four people. You would also have enough to then freeze some to enjoy later. Would I make this again? You bet! I ate two large bowls the night I made it and only wish I had taken my own advice and doubled the recipe! Fantastic tomato soup recipe! Although, I’ve never had a chilled variety of tomato soup, on a hot almost-summer day, this soup was superb! The soup has a velvety, creamy texture without any cream. There are several different flavors going on here, (i.e., the fennel, the basil, red pepper) but they all meld very well. I did read the recipe wrong and accidentally used cherry tomatoes for a portion of the three pounds of tomatoes, in addition to a Cherokee Purple, a striped green, and a Sun Gold. The cherry tomatoes worked very well; I just blanched them a little longer. They told me when they were ready by floating to the top! I was surprised the recipe didn’t say to slit a cross in the tomato skins for ease of peeling, and next time I will be sure to do this. I did use an immersion blender instead of adding the soup to a traditional blender; this worked very well! The feta, tomatoes and olives are fantastic garnishes and so is the fancy olive oil I used! You have to love a recipe that says, “Season to taste with…celery salt.” Perhaps this is the Chicago in me — celery salt is how we dress up a Chicago hot dog — but wow, it really works in this soup! From reading the recipe I was a little concerned about texture. I like smooth tomato soup, so I usually strain it as a final step. This recipe didn’t call for that and had several ingredients that might have added texture. However, I really liked the final result. I slightly undersalted the soup, since I knew that I was serving it with salty condiments, and that was the right choice. I served it first without hot sauce, but then offered it to anyone who wanted to add it at the table. To me, this is the epitome of Mediterranean cooking. I happened to have on hand some very ripe, flavorful, and juicy tomatoes (especially so for supermarket ones), some feta, and a jar of Niçoise olives. A gift of a beautiful basil plant made this recipe a must-try choice. For me, this recipe is perfect as written. Next time, I may omit the onion and double the leeks, simply because I prefer leeks. I used homemade chicken broth this time, but may try homemade vegetable broth next time. I think canned, reduced-sodium chicken broth would be fine. I would avoid using vegetable broth from a can or carton, because I think it can have a rather harsh flavor. The celery salt is definitely “to taste,” as I believe too much of this could ruin the recipe. As for the garnish, I will double or triple the amount next time. This would be good served on toasted baguette slices or tossed with some fresh spring greens. This soup improves after a day or two in the refrigerator. I will also try this soup served hot or at least slightly warm. I also started out on the light side with both the hot sauce and white pepper. You can always add more if necessary. This recipe is very easy to prepare. The “hardest” part: peeling the tomatoes. It’s a healthful, delicious, and nice soup for the hot summer. Since this was served at a late summer brunch, I had the idea to serve it in wide coffee cups. It filled about 11 cups. Each cup was garnished with feta, olives, basil, and oil, as suggested. I know it’s a keeper, because people loved it and asked for more; I promised to double the recipe next time, which will be very soon.